How do I setup Event Based Schedules in SQL-RD? 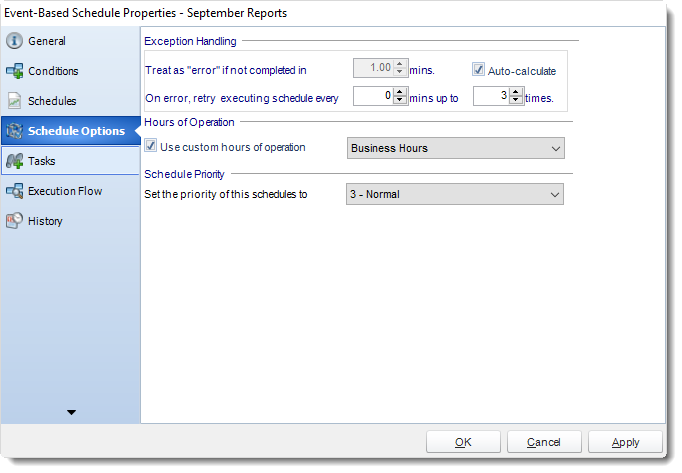 Event Based Schedules give you the ability to run any already existing schedule (enabled or disabled) when an event occurs. 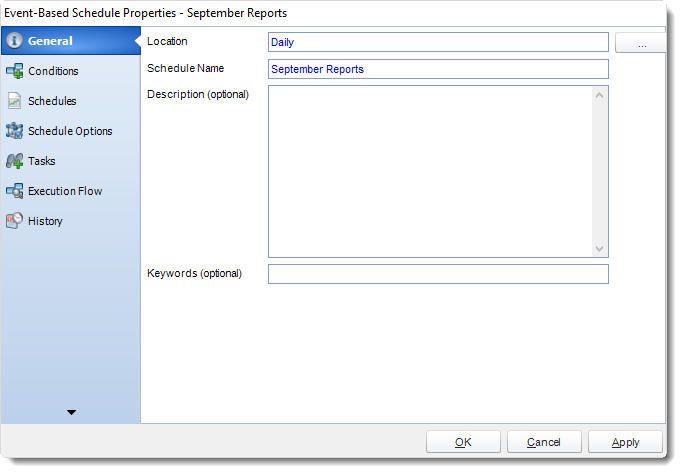 Event Based Schedule for SSRS. 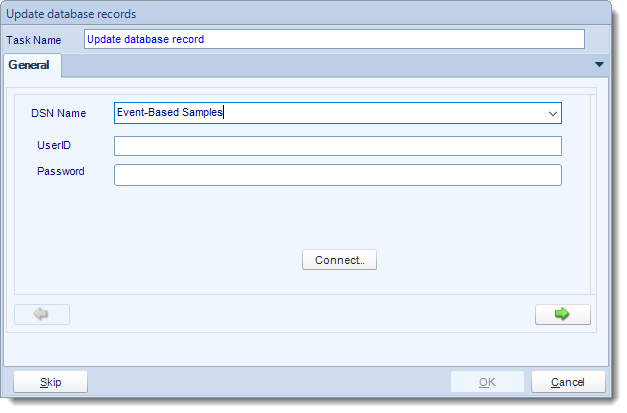 Event-Based Schedules give you the ability to run any already existing schedule (enabled or disabled) when an event occurs. The purpose of the wizard will be to guide you through the process of setting up an Event-Based Schedule. Use this schedule on its own, or in addition to a regular time based schedule for the same report. 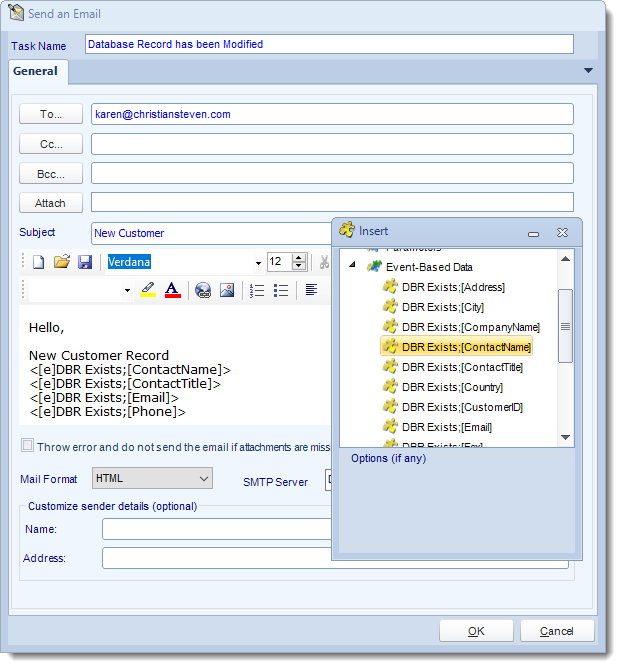 With Event Based Schedules you can unlock the power of SQL-RD's process scheduling engine. Combine Event Based schedules with Custom tasks to automate processes such as updating databases, server management, or system alerts. 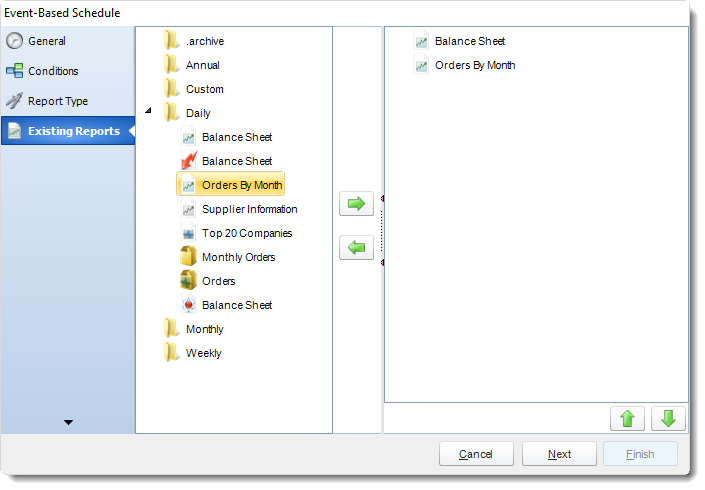 How to Create a Event Based Schedule for SSRS? Parent Folder: The SQL-RD folder where the schedule is stored. ANY: The schedule will work if ANY of the conditions are met. ALL: The schedule will only work if ALL of the specified conditions are met. Enabled: Check this option to enable or disable the schedule. Click Add to see all the Conditions type. 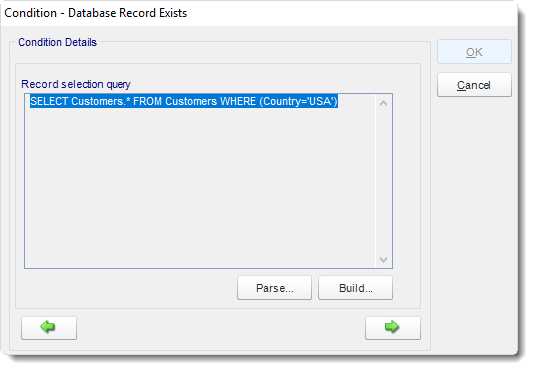 This condition will cause the schedule to be executed if a database record exists. If set to True, the schedule will be executed if the record exists e.g. when it is created. If set to False, the condition will be executed if the record does not exist. Click green arrow to continue. 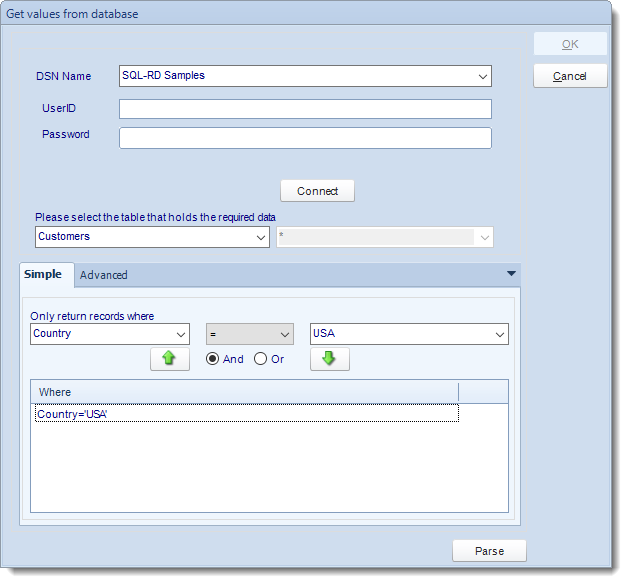 ODBC Datasource Name: Drop down and select a DSN. 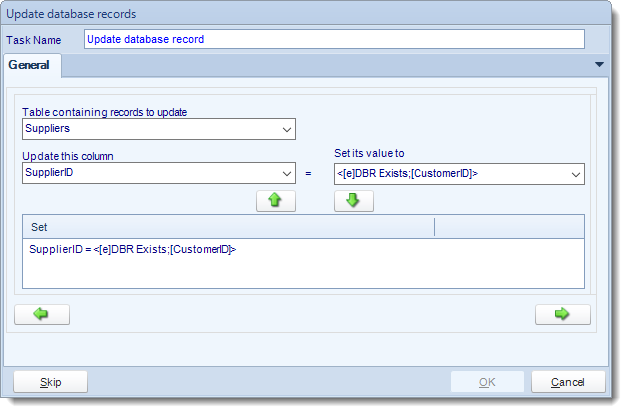 UserID: Enter the User ID SQL-RD should use to log on to the database. Select the Column that identifies the data in each row. This must be unique. It is typically referred to as the Primary key. Detect - New Records Only: The schedule will only act on records that were created after you wrote the schedule and the schedule will only be fired once for each record. After the first run, it is deemed not to be new anymore and the schedule will not fire. 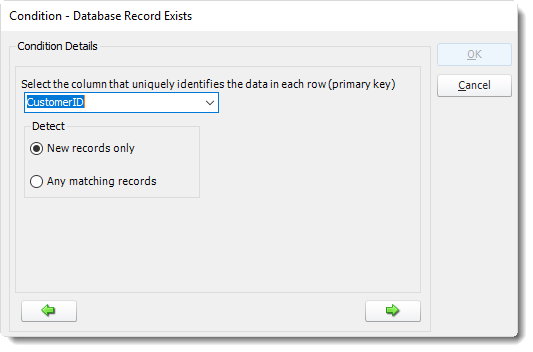 Detect - Any Matching Records: If this option is selected you should ensure that your query limits the returned values to just the record you are after. 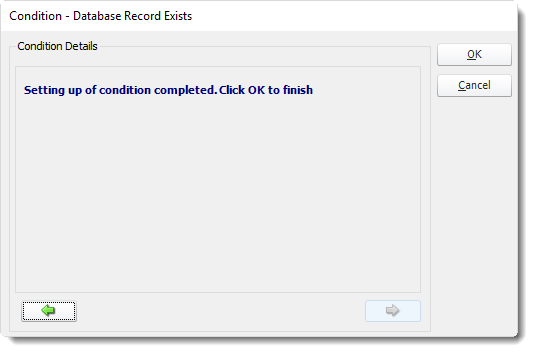 You must also write a custom action to update the database so that this record no longer fulfills the condition once the schedule has been executed, otherwise the schedule will continue to run each time it finds the same record. The schedule will only execute if it finds a sale over $1000 and the schedule sent field is not "t". When the schedule has executed, it will mark the record and thus ensure that the schedule does not repeat itself each time SQL-RD polls the database. 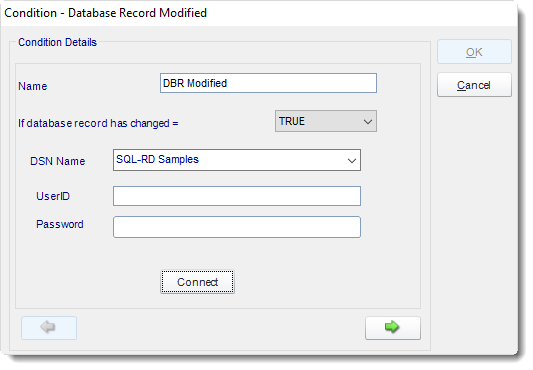 Detect Inserted and deleted Rows: SQL-RD will monitor for inserted and deleted rows as well as data that has been modified. 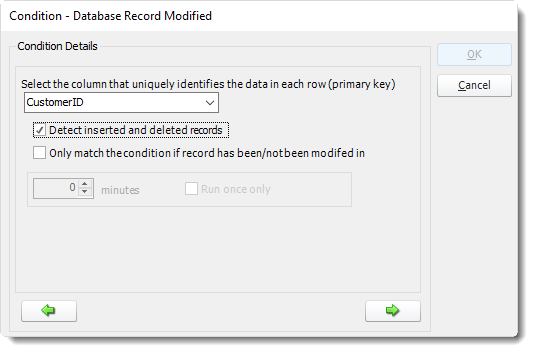 If Database Record has been / has not been modified: Check for records that have been / have not been changed within a set time frame. This condition will cause the schedule to be executed if a file exists. If set to True, the schedule will be executed if the file exists e.g. when it is created. 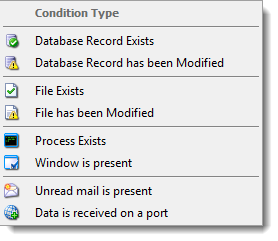 If set to False, the condition will be executed if the file does not exists e.g. if it is deleted. 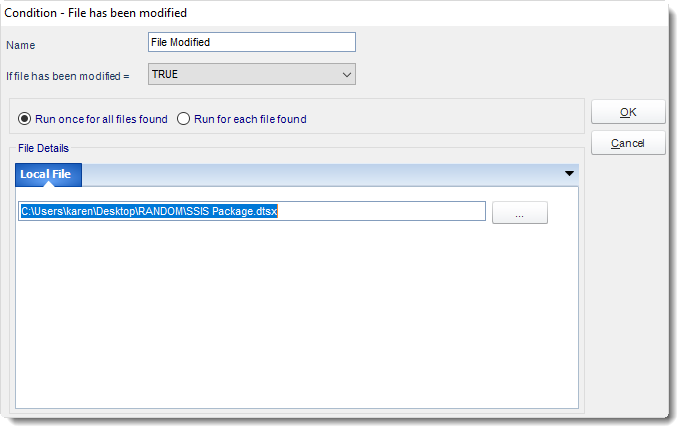 Run once for all files found: The schedule will perform the specified actions once for each file found that matches the criteria. 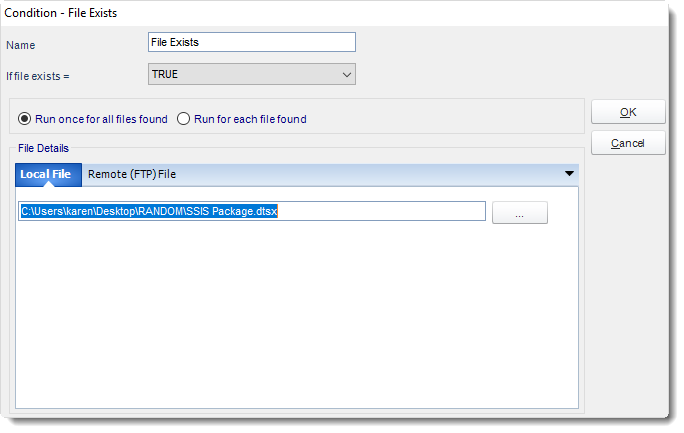 Run for each file found: The schedule will perform the specified actions ONCE only irrespective of how many files are found. Local File: Monitor for files on Local File. Hint: You can use the insert menu to create an ever changing file name. 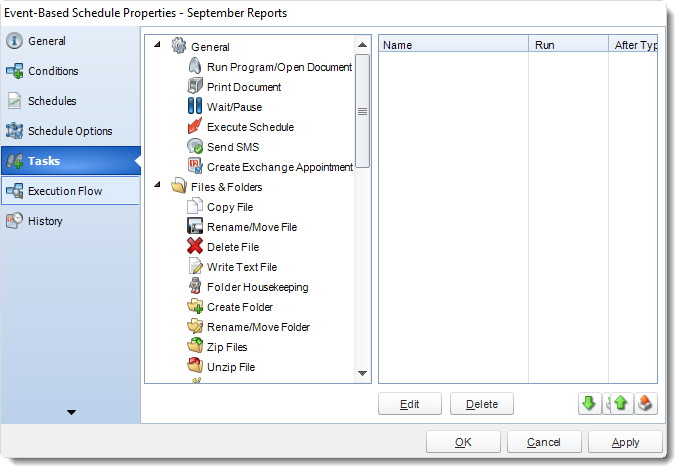 Remote (FTP) File: Event Based Schedule can also monitor for files on an FTP server. Enter the FTP Server Information. Verify: Authenticate to the server and enter the path where the file should be located. 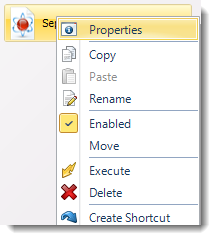 Hint: Combine this feature with Custom Actions FTP and FTP Folder Housekeeping to set up automatic FTP maintenance. This condition will cause the schedule to be executed if a file has been modified. This condition will cause the schedule to be executed if a process exists. If set to True, the schedule will be executed if the process exists. If set to False, the condition will be executed if the process does not exist. 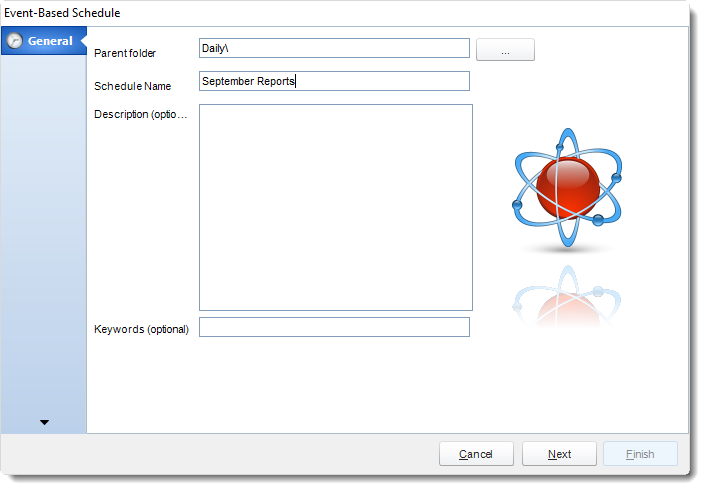 Type the name of the process in the drop down box or use the drop down arrow to select from a list of currently running processes. Tip: Try setting up the schedule that will monitor for certain key processes on your server. 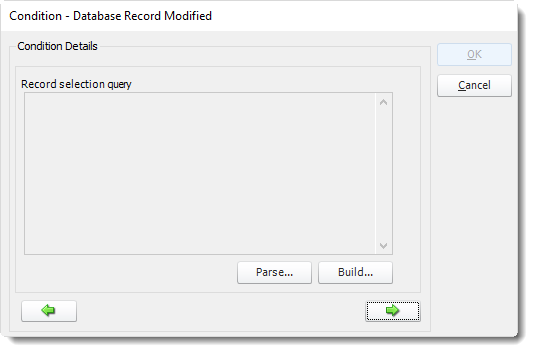 If those process are not running then SQL-RD can automatically restart them. 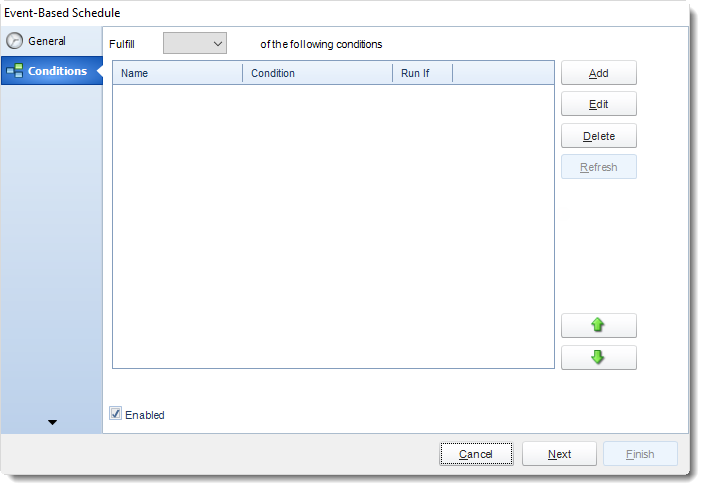 This condition will cause the schedule to be executed if a window is present. If set to True, the schedule will be executed if the window is present. Type in the window name, or use the drop down to pick from a list of currently open windows. Tip: Try setting up the schedule that will monitor for certain open Windows on your server. If those process are running then SQL-RD can automatically stop them. Users can send report requests to a specified email address. 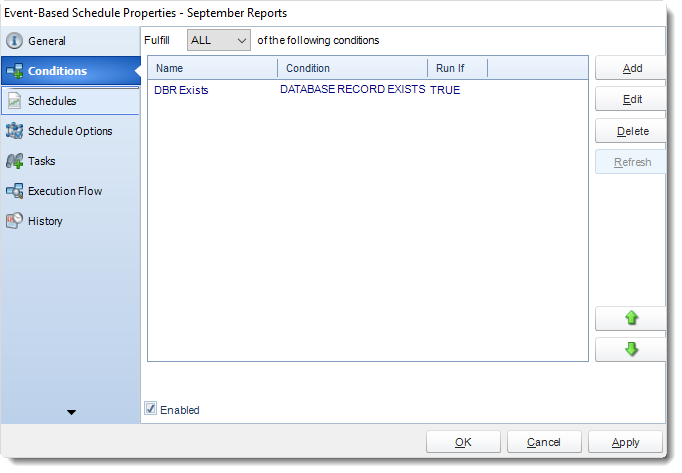 SQL-RD will read the email, and, if the conditions are met, fire off the specified report. Fill in your server credentials. If you have entered them correctly, the green arrow will become available. Select the folder that will be monitored. Specify the condition. Select the email fields to determine what would meet your requirements. Forward the Email: Forward the email to another address. Redirect the Email: Send the incoming mail directly to another address instead of keeping it in the inbox. Save Attachments: Pull attachments from the email and save them directly to a folder. 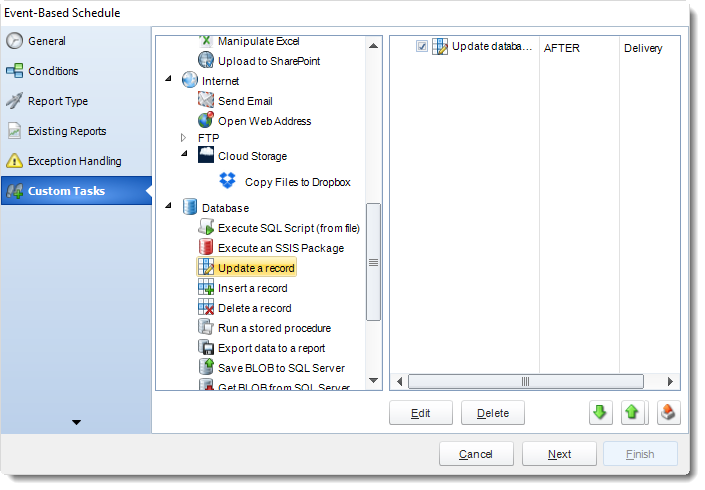 Remove Matched mail from Server: Choose to clear the email from the inbox once SQL-RD has processed it. If you do use this function with the condition set to false, then be sure to remove the found email from the mailbox so that the report doesn't get fired off again (each time read emails are found). 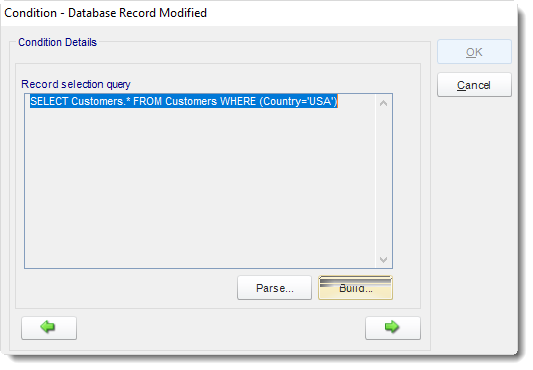 How to parse the values in the body of an email and insert them into SQL-RD fields? For an "Unread Email" event, SQL-RD can read the body text of the email and place selected values into Event-based constants. 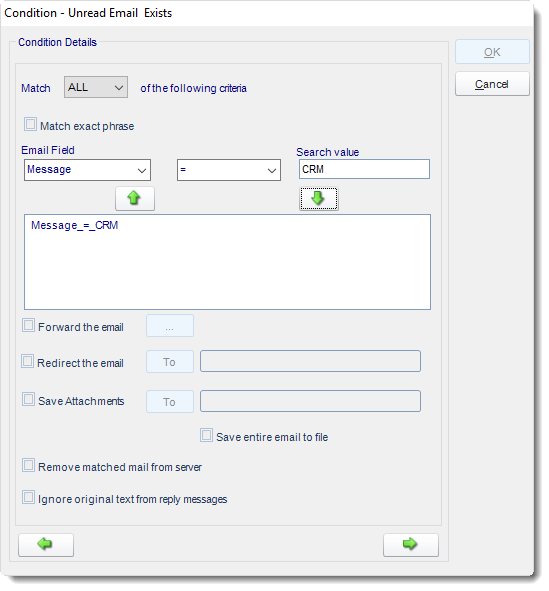 You can also use the "Exact Match" option which will match the Case of the email text. In addition, when this option is used, spaces before and after the phrase are NOT removed and form part of the matching string. Mary has an email which will contain values, and she wants the values to update a database. Here's how she would set it up in SQL-RD. As you can see, the required constant is on the left of the colon (:) and the required data is on the right. She clicks down arrow to add the statement to the list. And repeats the process for all the custom constants she will need to parse the email. 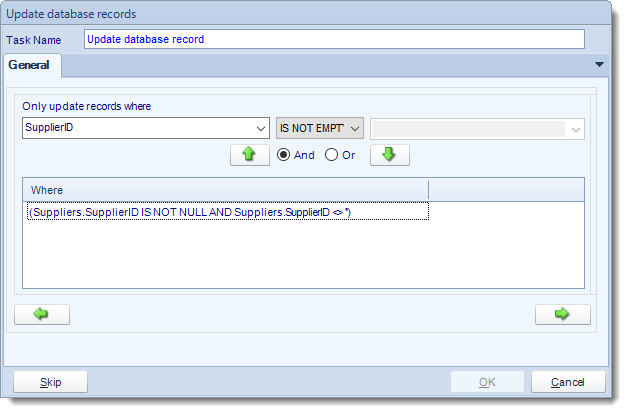 The above instruction tells SQL-RD to read the email body text and to place the value to the right of "EmployeeID:" in the database. The colon (:) is only required in the email body. It is not used as part of the definition process above, but SQL-RD will automatically read the value to the left of the colon and apply the data to the right of the colon. 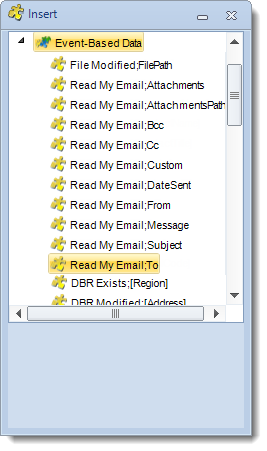 Tip: Use email body parsing to customize other tasks! 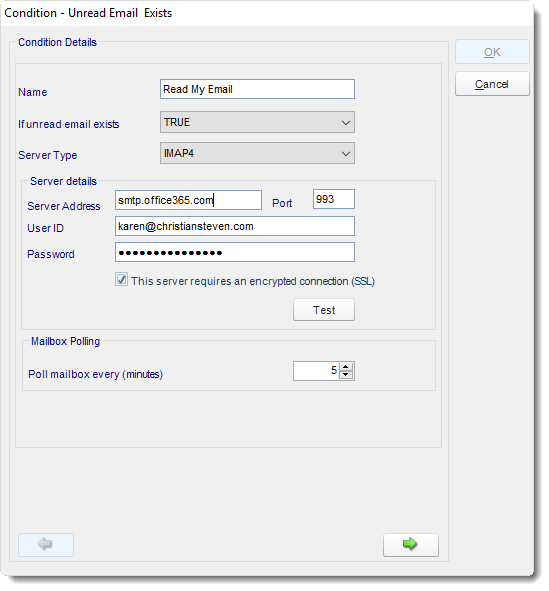 Pull information from one email and send an email using the data. Use it to create new database records, and much more! 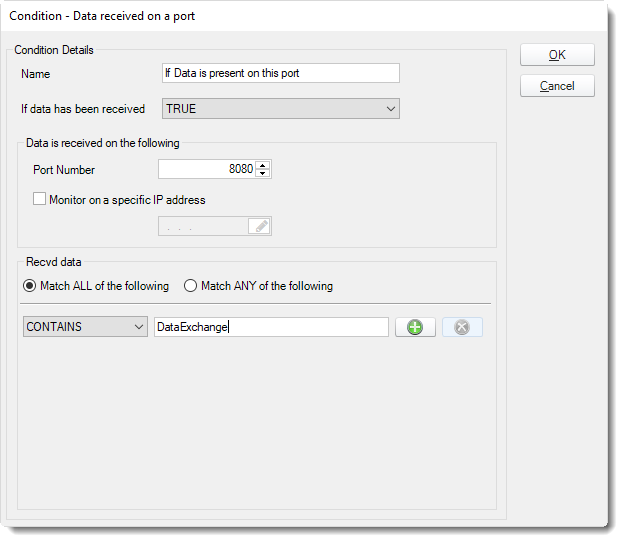 If data has been received: Select true if you wish to monitor for data in the given port, or false if you wish to monitor for the absence of data in the given port. Port Number: Enter the port number that will be monitored. Monitor on a Specific IP address: enter the IP address that will be monitored. Received Data: Select the data criteria using the lower menu. 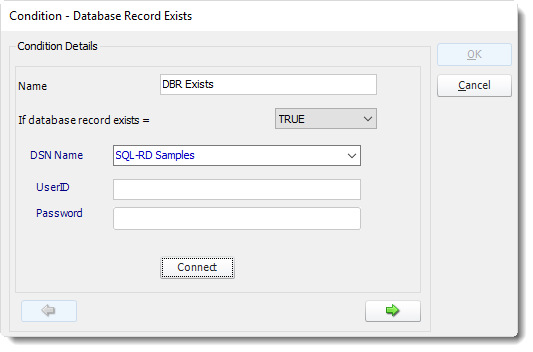 SQL-RD will monitor for this data for any data matching your criteria. 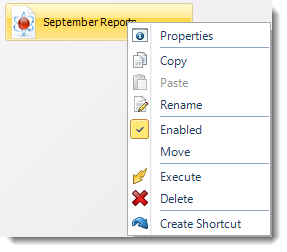 New Reports: Display a screen where you can create a new reports schedule. 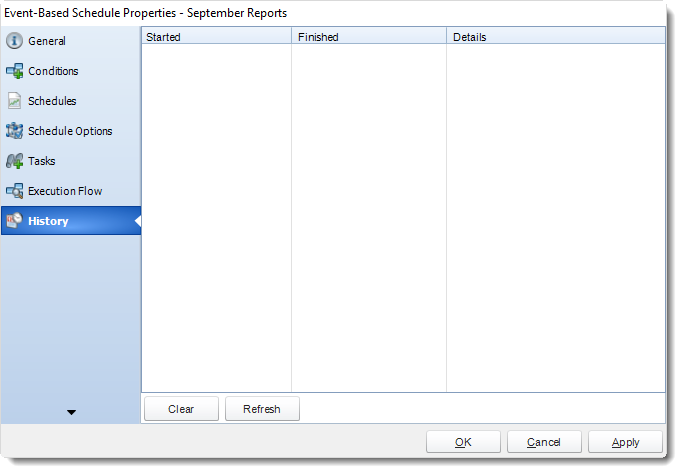 To add a new SSRS report, click here. 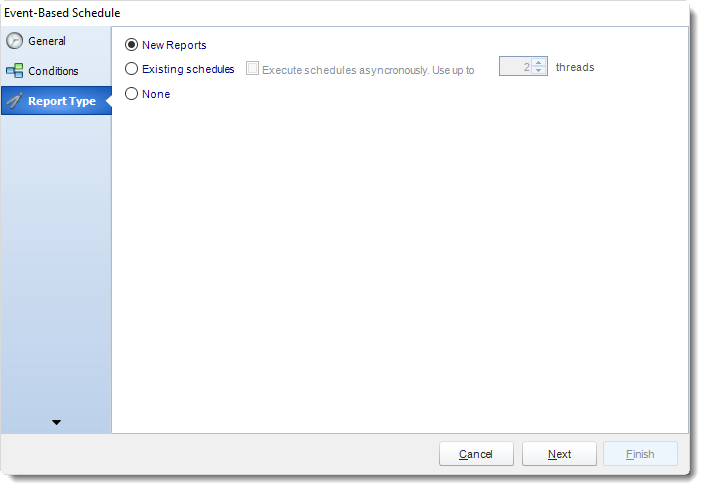 Existing Schedules: Displays a list of existing schedules in SQL-RD for you to choose from. 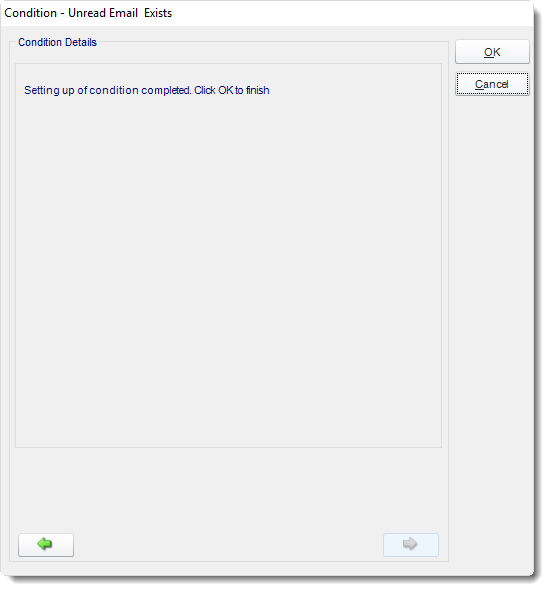 None: Select this option if no schedules are to be ran if the conditions are met and only Customs Actions will be used. A list of existing schedules will be displayed in the left hand pane. Click on the schedule that needs to run if the conditions are met and use the green arrow to select it. Schedules that are going to run if the conditions are met are shown in the right hand pane. Reports fail for any number of reasons - database connectivity issues, database busy, network issues and more. This screen gives you the ability to tell SQL-RD what to do if it encounters an error. Hours of Operation: Event based schedules can poll 24 hours a day if required. 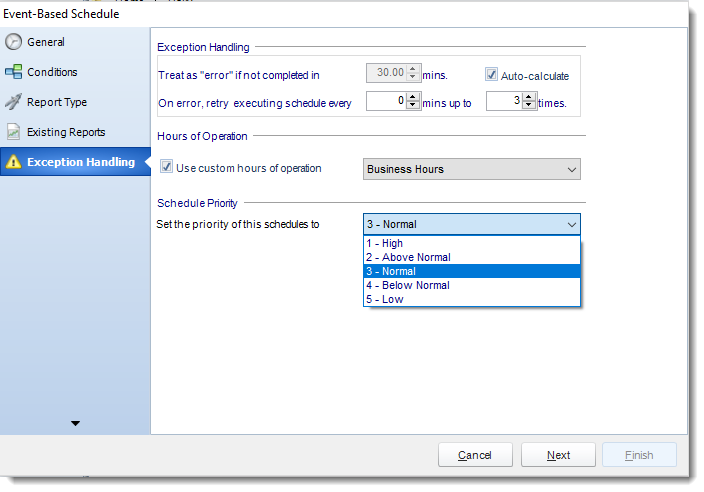 Checking this option will allow you to set a specific time frame for when the event based schedule should run. Schedule Priority: Set the priority level of the schedule. This will come into play when other schedules are running at the same time. If the priority is set to High then the event based schedule will take priority over other schedules in the queue. If the priority level is set to low then it will be at the bottom of the queue and the other schedules will be ran first. Click Next to continue to the next wizard. If you have no desire to add a Custom Task, you can click Next. 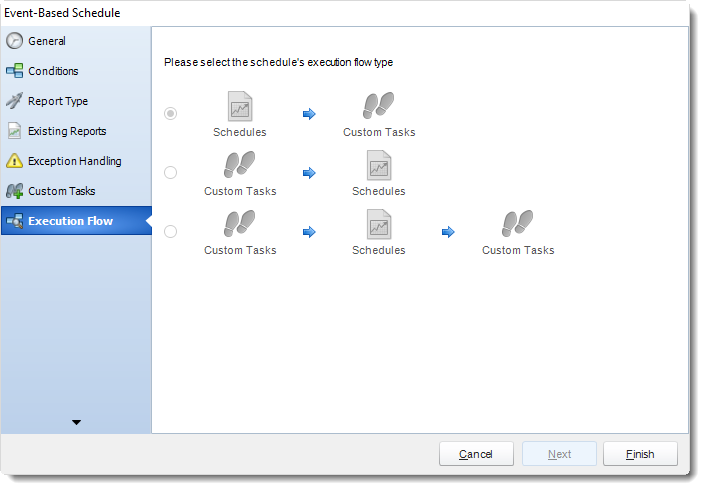 In Event Based Schedule, you can select a custom task to run as a result of any of the conditions being met. Select the DSN name you want to update. Hint: In Event Based, you can select another DSN to run tasks. 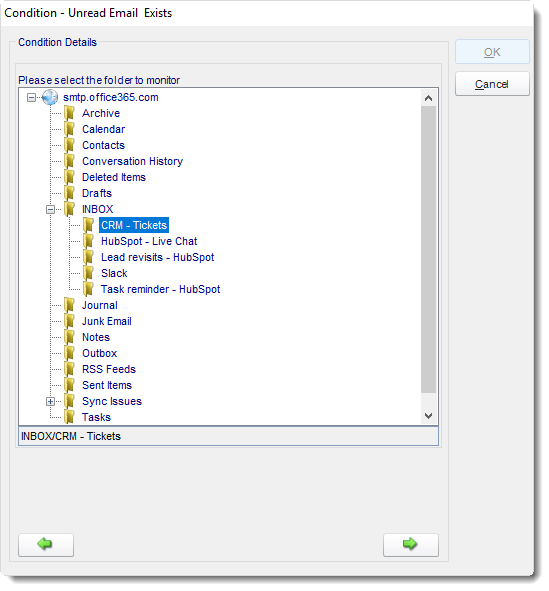 Hint: When sending an email you can use Event Based inserts to reference the condition that triggered the email. After adding all the required Custom Actions, click Next to continue. If you have schedules AND tasks being executed as part of the event based schedule you can determine the order. 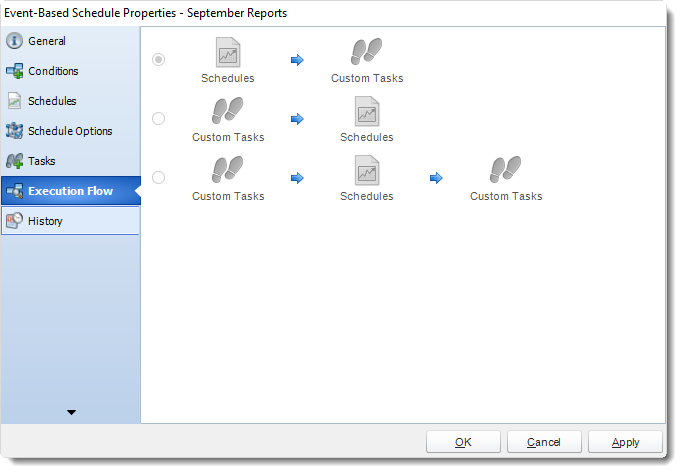 Run the Custom Actions first, then the schedules, the run the Custom Actions again. Right-Click on a schedule to see the following actions. 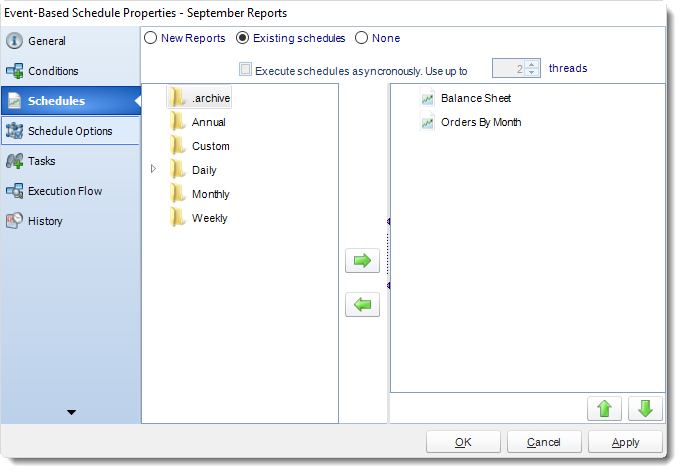 Properties: Access the schedule set up for editing. Or you can just double click on the schedule. Copy: Use this to copy an existing schedule. You can then paste it into another folder or the same folder. 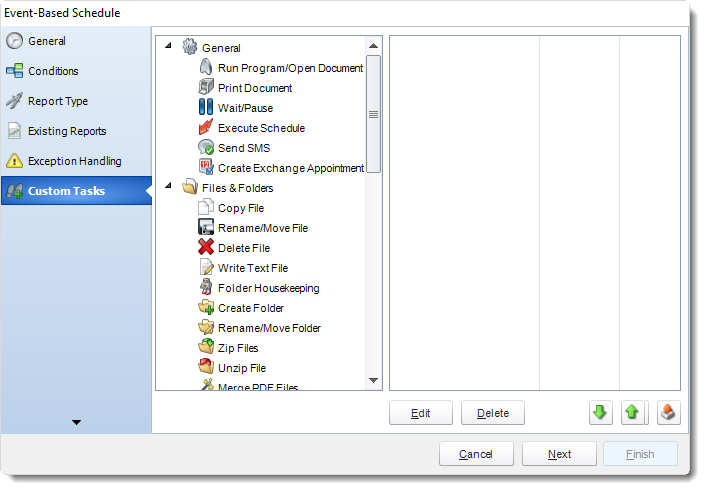 Simply open the folder you wish to paste to, right-click in the "white" space and select "Paste". Follow the on-screen instructions to complete the process. Paste: Paste a previously copied schedule. Enabled: Schedules are enabled when there is a check beside this option. To stop a schedule from running, or to "pause" it for a while, select this option to remove the check. Disabled schedules will not run till they are enabled again. Execute Schedule: This will execute the schedule immediately. Note that the next run date and time is not moved on as a result of a manual execution. This only moves on if the schedule is run automatically by one of the schedulers. Delete Schedule: Selecting this option will delete the schedule.